We know what it’s like, many of us, to be in one “place” on our way to “the” place. That’s the summary of David’s beginning. He was king…but not really, not yet. Prophet Samuel anointed him; in fact, he held up the dinner with Jesse and his sons until David arrived (1 Samuel 16:11). From the moment Samuel poured the oil, David was anointed. The Spirit of the Lord came mightily upon him. Behold now, an evil spirit from God is terrorizing you. The servants begged Saul to command them to find a skillful player on the harp to make Saul well when the evil spirit came upon him. Saul agreed. And here’s our focus…for it’s David at this “place”. #1: BEFORE HE WAS KING, HE WAS THE LORD’S ALLY. Saul needed a friend of God to bring comfort through service. The service just happened to be his musical gift. Saul did not honor the gift, nor the service. We know this because Saul did not honor God; that’s how he got into this terror with an evil spirit from God. 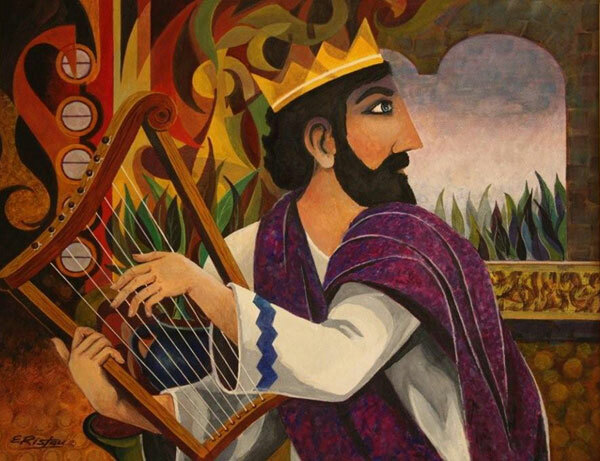 David’s musical skill was a means to an end, and that end was Saul’s comfort — not David’s promotion or excellence or love for God. Saul just needed someone else who wasn’t experiencing terror from God to get to God for Him and bring relief. My dear sister Abigail, I think it’s a good time to revisit David’s beginnings and to take another look at the man before us. There was much already in him and developed and ready for reigning before he was king. Let us proceed with care, and learn all we can. The kingdom needs us too.